A woman holds up a BlackLives Matter sign at the Michael Brown memorial in Ferguson, Missouri, U.S., on August 9, 2015. 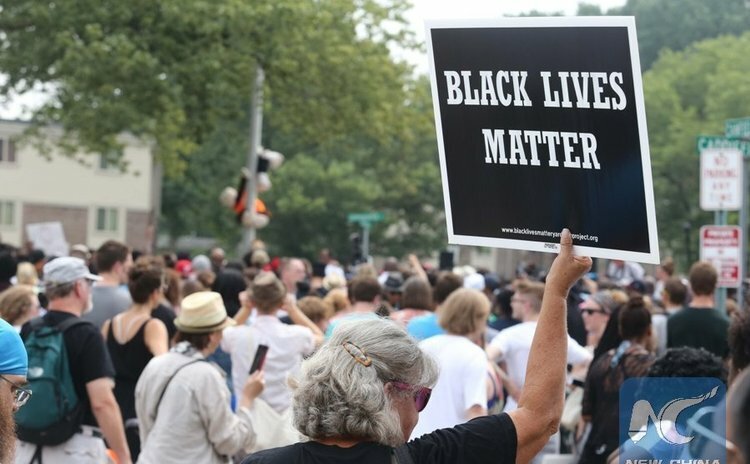 HOUSTON, July 6 (Xinhua) -- The U.S. Department of Justice began on Wednesday a civil rights investigation into Tuesday's officer-involved fatal shooting of a black man in Baton Rouge, the capital city of the U.S. state of Louisiana. A police spokesman said at a press conference in Baton Rouge on Wednesday that while the Justice Department will investigate potential civil rights violations, Louisiana state police will supplement the investigation to determine if any criminal actions took place, according to New Orleans' daily newspaper The Times-Picayune. The FBI's New Orleans Division also confirmed the investigation in a statement on behalf of the Justice Department, saying that the Justice Department's Civil Rights Division, in cooperation with the office of Walt Green, the U.S. Attorney for the Middle District of Louisiana, has opened an investigation into the shooting and will not comment further "at this time." The Justice Department will collect all available facts and evidence and conduct a fair, thorough and impartial investigation, the FBI said in the statement. Officers Blane Salamoni, a four-year veteran in Baton Rouge, and Howie Lake II, a three-year veteran, were the two officers seen in a video circulated widely on social media showing one angle of the the fatal shooting of the 37-year-old Alton Sterling. The two officers pinned Sterling to the ground, someone yelled, "He's got a gun! Gun!" and gunfire erupted moments later. But the spokesman Lt. Johnny Dunham refused to answer which officer fired his weapon. Sterling was reportedly selling homemade CDs and DVDs outside a store in the early hours of Tuesday morning when the two police officers arrived on the scene, responding to an anonymous 911 call about a man in a red shirt threatening people with a gun. The store's owner Abdul Muflahi told local press that the two officers showed up, and an altercation broke out between the two officers and Sterling. The first officer used a stun gun on Sterling and the second officer tackled him to the ground. As Sterling tried to get the second officer off him, the first officer fired several shots, killing the black man instantly. Dunham said that the two officers wore body cameras during the shooting incident, but both became detached during an altercation with the Sterling that preceded the shooting. Audio and video footage was still captured and will be turned over to federal investigators. He said that all leaders believed it was best to "take impropriety out of the equation," including the potential appearance of it, by handing the investigation over to State Police and the federal government. Louisiana Governor John Bel Edwards also said on Wednesday that he had "serious concerns" about the shooting incident. The video of Sterling's death fueled anger in Baton Rouge, with hundreds protesting on Tuesday night and demonstrations continuing on Wednesday. Community leaders and Sterling's family demanded a federal investigation.